Chris Chelios, a three-time Stanley Cup champion and three-time Norris Trophy winning defenseman, announced today that he will retire from the National Hockey League after 26 seasons. Chelios played for the Montreal Canadiens, Chicago Blackhawks, Detroit Red Wings and Atlanta Thrashers during his illustrious NHL career. He retires having played the most games by a defenseman in NHL history (1,651) and as the only player in league history to play in over 400 games for three different teams (Chicago-664, Detroit-578, Montreal-402). Chelios, 48, was originally a second round draft pick (40th overall) of Montreal in the 1981 NHL Entry Draft. Following his selection by the Canadiens, he played two seasons for the University of Wisconsin, helping the Badgers lay claim to the 1983 NCAA National Championship with a 6-2 win over Harvard in the championship game. Chelios was named to the all-tournament team. The Chicago, IL, native devoted the following season to playing for U.S.A. Hockey in preparation for the 1984 Winter Olympics in Sarajevo. It was the first of four Olympics in which Chelios would don the red, white and blue during his international hockey career (1984, 1998-team captain, 2002-team captain/silver medalist, 2006-team captain). He would also represent the U.S.A. in three Canada Cups (1984, 1987, 1991), two World Cup of Hockey events (1996, 2004-team captain) and once at the World Junior Championship (1982). Chelios' NHL career began shortly after his first Olympics appearance on March 8, 1984, when the Canadiens played host to the Hartford Whalers. He would play in 12 regular season games and 15 postseason contests for Montreal that year. The following season, Chelios blossomed into an elite NHL defenseman, securing a spot in the 1985 NHL All-Star Game, finishing second in Calder Trophy voting as the NHL's Rookie of the Year (Mario Lemieux) and being named to the NHL's All-Rookie Team. He would spend seven seasons in Montreal, playing in 402 regular season games and 98 playoff contests. Chelios helped the Canadiens win their 22nd Stanley Cup championship in 1986. He claimed his first Norris Trophy as the NHL's best defenseman in 1989 and was named a first team NHL All-Star. He would again be selected to represent Montreal at the 1990 NHL All-Star Game. On June 29, 1990, Chelios was traded along with a second round draft pick to his hometown Chicago Blackhawks in exchange for NHL Hall of Famer, Denis Savard. Chelios' elite play would continue in the Windy City. During his nine seasons with Blackhawks, he played in 664 regular season games and 65 postseason games. He represented Chicago in seven NHL All-Star Games (1991-94, 1996-98). Chelios helped lead the Blackhawks to the Stanley Cup Final in 1992 before losing to the Pittsburgh Penguins in four games. It was Chicago's first appearance in the Stanley Cup Final since 1973. During the postseason run, he recorded 21 points (6-15-21) and added 37 PIM in 18 playoff games. Chelios won two Norris Trophies (1993, 1996) in a Blackhawks sweater and was runner-up to Paul Coffey of the Red Wings in 1995. He was named a first team NHL All-Star three times (1993, 1995, 1996) and a second team All-Star twice (1991, 1997) in Chicago. On March 23, 1999, Chelios was again traded, this time to arch-rival and two-time defending Stanley Cup champion Detroit in a trade deadline deal for defenseman Anders Eriksson and two first round draft picks (1999 and 2001). Chelios played in 10 regular season games and averaged over 27 minutes of ice time in 10 postseason games following his move to the Motor City in 1999. In 2000, he was selected to represent his third different team at the NHL All-Star Game. Despite what seemed to be a short-term addition to the Red Wings' blue line, Chelios eventually spent over nine seasons wearing the winged wheel. In 2002, at the age of 40, Chelios appeared in his 11th and final NHL All-Star game, finished with the highest plus-minus rating in the NHL (+40), finished second in Norris Trophy voting to teammate, Nicklas Lidstrom, and was a first team NHL All-Star for the fifth time in his career. Chelios played an integral role in helping the Wings capture the 2002 Stanley Cup, the second of his career. He would add a third championship to his resume with Detroit in 2008 at the age of 46. In total, Chelios would appear in 578 regular season games and 103 postseason games for the Wings. On March 2, 2010, Chelios signed with the fourth team of his NHL career, the Atlanta Thrashers. He appeared in seven games for Atlanta, playing his final NHL game on April 6, 2010, when the Thrashers faced-off against the New Jersey Devils. In a credit to his competitiveness, determination and longevity, Chelios retires as the oldest U.S. born hockey player of all-time and the second oldest player in NHL history behind the legendary Mr. Hockey, Gordie Howe (52). Chelios' accomplishments place him among the game's all-time greats. He played the fourth-most regular season games in NHL history (1,651), the most postseason games in NHL history (266), he ranks second all-time among defensemen with 2,891 penalty minutes, eighth all-time among defensemen with 763 assists and 10th all-time among defensemen with 948 points (185-763-948). His postseason numbers include 144 points (tied seventh all-time among defensemen) and 423 PIM (first all-time among defensemen). Off the ice, Chelios has been active in charitable efforts throughout his career. 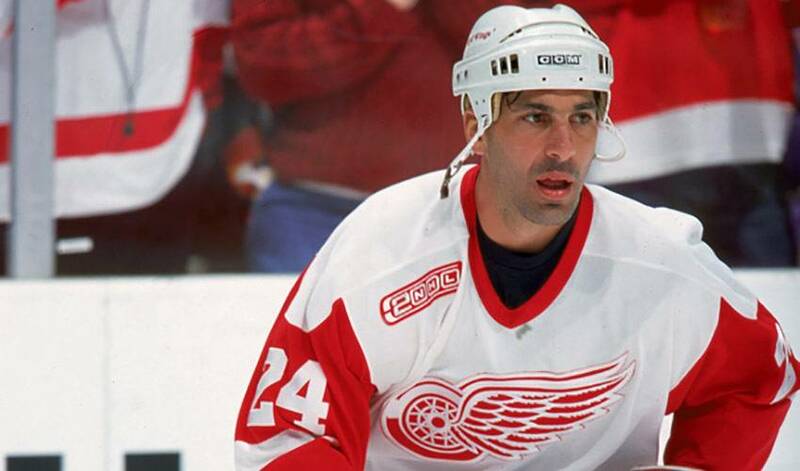 In 1992, he established the Cheli's Children's Foudation, which has donated over $2 million to various children's charities throughout Chicago and Detroit, including the Make-a-Wish Foundation, Children's Memorial Hospital, Cystic Fibrosis Foundation and the American Hearing Impaired Hockey Association. Chelios will return to the Red Wings as Advisor to Hockey Operations. He will work closely with Detroit's front office and coaching staffs, providing insight on a wide range of on-ice issues while helping to develop and mentor young players within the organization. He will also assist on the business operations side of the team, appearing at games and other functions to interact with fans and potential business partners. Chelios will continue to reside in the Detroit area with his wife, Tracee, and their two daughters, Caley and Tara. His two sons, Dean and Jake, are currently enrolled at Michigan State University and will play hockey for the Spartans this fall. Chelios, Niedermayer and Shanahan honoured as part of the 2013 Hockey Hall of Fame Induction.